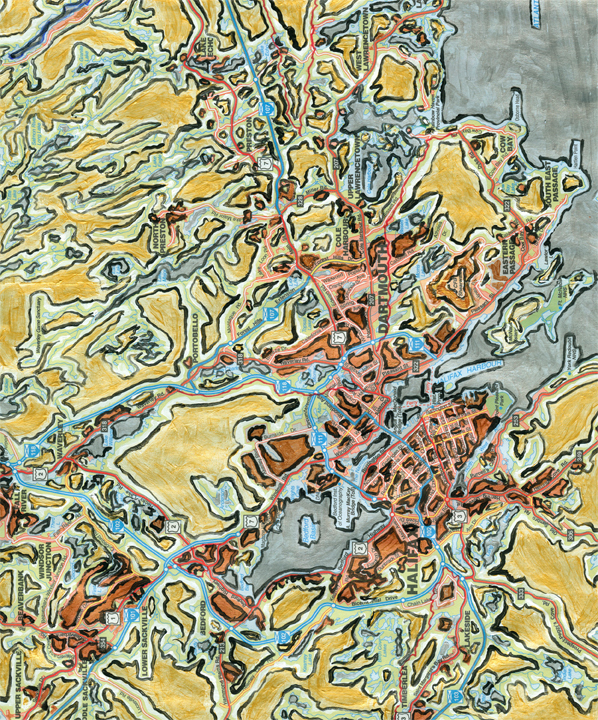 Ms. Haly Fax's Daydream, 2011, Map of Halifax and Acrylic, 8 1/2" x 10"
In the second phase of painting on maps I’ve consicously tried to approach the maps in two different ways. In the abstract map paintings I am choosing to focus on the spaces between the lines (organic and geometric lines) as shapes in themselves. I have to actively work on setting aside my primitive mind – that which sees faces everywhere (pareidolia). I have felt overly caught up and tied into these fairy tales that I create and wanted to challenge myself to be free of them. Although I have to work to NOT see dis/figures I do enjoy responding solely to the spaces and the colours. It was relaxing to fill in what was given to me and not try to solve a riddle of lines. 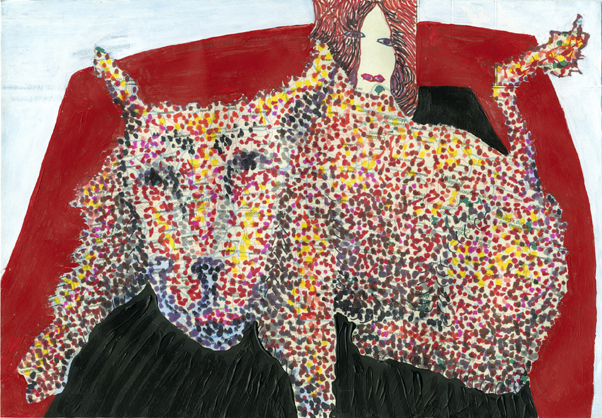 Southern North America - The Lap Dog, 2011, Map, acrylic and permanent marker, 6" x 8.5"
On the other hand, there are still those maps where I simply love the story or feel compelled by the dis/figure and somehow obligated to its creation. On these maps I tried to devote myself more to the figure and less to the details of the map. As I lose the map, the image loosens it’s original reference point. It seems I still can’t help myself from re-incorporating that link in the form of a Title. Once a narative, always a narrative. I figure (nyuk nyuk) these various techniques will continue to blend into eachother in PHASE III of maps.